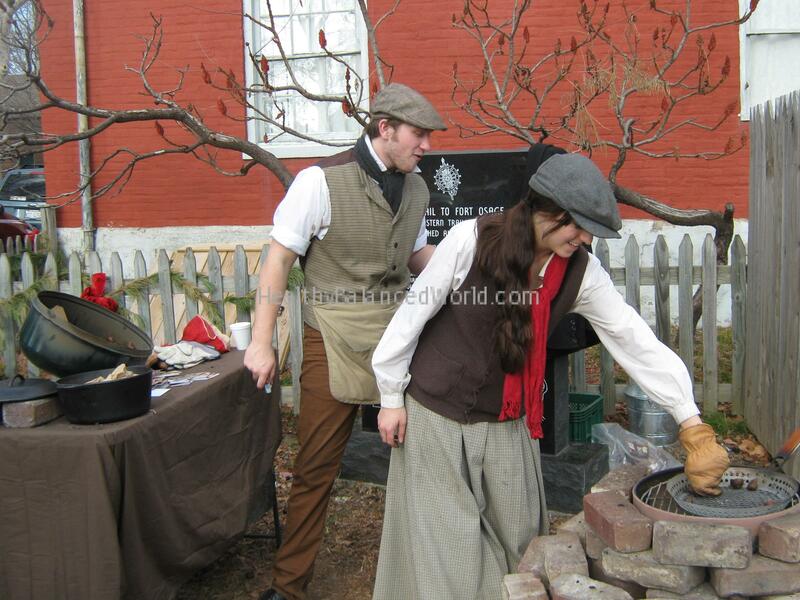 Last winter I had the opportunity to visit the St. Louis suburb of St. Charles, where townsfolk dress up in costumes from the late 1800’s to early 1900’s, recreating Christmas from the past. One of the scenarios they provide is chestnuts roasting on an open fire, just as you hear in the classic Have Yourself A Merry Little Christmas song. It is no accident that chestnuts are roasted, as it’s hard for your body to digest them if you eat them raw, since they have high tannic acid content. You do have to remember to score them before roasting or they will explode in your oven or open fire. If they do get over-roasted, your body again will have a hard time digesting them. Boiling and steaming them are other ways to eat them. Better yet, adding chestnuts to your food instead of eating them on their own add a wonderful flavor to dishes. My family roasts or steams them, and adds them to our annual Christmas stuffing. One of the towns in Greece my mother’s family grew up in is called “Kastri,” and is known for its beautiful majestic Chestnut trees that surround it. Chestnut in Greek is called “Kastano.” My grandfather grew a few trees and sold the nuts at an open market with his other produce. Our household growing up in Canada wasn’t the same if winter passed and we didn’t eat at least one roasted chestnut that my mother insisted was good for me and was the healthiest winter snack. Turns out she really was right; they contain vitamins B1, B2, B6, C, Niacin, Calcium, Phosphorus, Folate, and Iron, which promote growth. They may have the least amount of protein out of all nuts, but they also have the least amount of fat and calories. In fact they have no fat and 4.1 calories per 100 gram (3.5 oz.) serving. 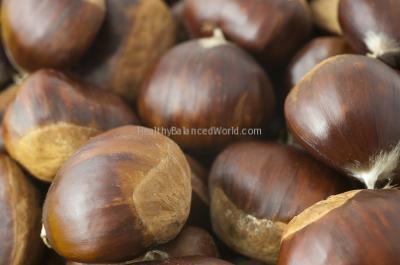 Chestnuts also produce an alkaline reaction in the body, in other words they help to reduce acidity in the body. You only need to eat a small amount of these, or any nut to get the health and protein benefits from them. Plus chestnuts have no cholesterol content and are high in fiber. According to Traditional Chinese medicine, chestnuts warm the body, which would explain why they are viewed as something to eat to strengthen the immune system to ward off the flu and infection. Chestnuts can also strengthen the kidney-adrenal system, which can get worn out from stress or changes in hormones. Many people in North America are not sure of what to do with chestnuts when they see them unless they are from an area that grows them. Europeans and Asians tend to incorporate them in their food more often. Chestnuts need to be stored someplace cool, away from light heat and moisture like the refrigerator drawer or freezer, and can last for months if you do so. The Italian town of Porretta Terme, close to Tuscany, is known for incorporating chestnuts in various forms of food. During WWII they had an abundance of chestnuts during the winter, and very little meat to eat. They learned how to roast chestnuts and grind them into a flour to create a protein packed cake called Castagnaccio, substituting their lack of meat. The next time you see someone roasting chestnuts on a corner during the winter, give them a try, especially if you are looking for a high-impact snack that is healthy. Don’t just sing songs about them at Christmas time! Know that this little nut will help your immune system through the winter and help women’s bodies have strength during menopause. The Tao of Nutrition – Third Edition, by Maoshing Ni, Ph.D., O.M.D., and Cathy McNease, B.S., Dipl. C.H.